I am making an autonomous bot where i need to power a few sensors (IR, PIR, sonic,etc) and an arduino. In total the sensors draw about 300 mA current(max). My power supply is a LIPO of 12 V (11.1 V), 25C, 2200 mAh. I need this supply to control the motors and provide them enough power. My sensors and microcontroller will essentially work on 5V, so I need to step down the voltage from my supply too. Using 7805 is inefficient as its causing too much heat and as I need to run the bot continuously for a long time, I don't want to use a linear regulator. 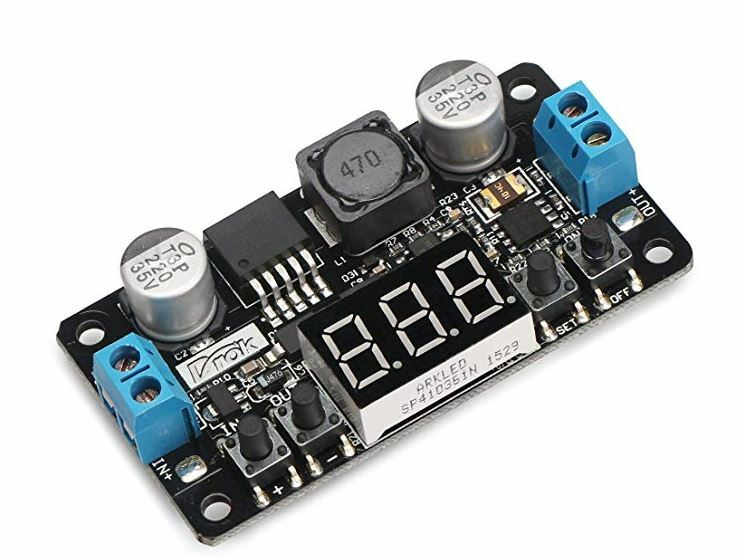 Should I use a buck switching regulator with a LM2596S? If yes, why and what other choices are available that i maybe missing out? Any help would be greatly appreciated. For a project like this you should use a self contained switching regulator. The device you linked would be more accurately described as a switching controller. Unlike a 7805, it requires many external components with specific values to function correctly. Not the answer you're looking for? Browse other questions tagged power-supply voltage-regulator buck step-down or ask your own question. How do I step down voltage and current in a DC application? The role of reference voltage in buck converters? Power supply for robotics project? How to deal with an inconsistent / noisy power signal?